Robert Louis Balfour Stevenson (13 November 1850 - 3 December 1894) was a Scottish novelist, poet, essayist and travel writer. His best-known books include Treasure Island, Kidnapped, and Strange Case of Dr Jekyll and Mr Hyde. A literary celebrity during his lifetime, Stevenson now ranks among the 30 most translated authors in the world, just below Charles Dickens. He has been greatly admired by many authors. Gabriel John Utterson, a lawyer, is on his weekly walk with his relative Richard Enfield, who proceeds to tell him of an encounter he had some months ago while coming home late at night from Carvendish Place. The tale describes a sinister figure named Mr Hyde who tramples a young girl, disappears into a door on the street, and re-emerges to pay off her relatives with 10 pounds in gold and a cheque signed by a respectable gentleman -- Dr. Henry Jekyll, a client and friend of Utterson's -- for 100 pounds. Jekyll having recently and suddenly changed his will to make Hyde beneficiary, Utterson is disturbed and concerned about this development, and makes an effort to seek out Hyde. Upon finally managing to encounter Hyde, Utterson is amazed by how ugly the man seems, as if deformed; though Utterson cannot say exactly how this is so or why it is, Hyde seems to provoke an instinctive feeling of revulsion in him. Much to Utterson's surprise, Hyde willingly offers Utterson his address. Jekyll tells Utterson not to concern himself with the matter of Hyde. A year passes uneventfully. One night, a servant girl witnesses Hyde beat a man to death with a heavy cane - MP Sir Danvers Carew, also a client of Utterson. The police contact Utterson, who suspects Hyde of the murder. He leads the officers to Hyde's apartment, feeling a sense of foreboding amid the eerie weather (the morning is dark and wreathed in fog). When they arrive at the apartment, the murderer has vanished, but they find half of the cane (described as being made of a strong wood but broken due to the beating) left behind a door. It is revealed to have been given to Jekyll by Utterson. Shortly thereafter, Utterson again visits Jekyll, who now claims to have ended all relations with Hyde. Jekyll shows Utterson a note, allegedly written to Jekyll by Hyde, apologizing for the trouble he has caused him and saying goodbye. That night, however, Utterson's clerk points out that Hyde's handwriting bears a remarkable similarity to Jekyll's own. For a few months, Jekyll reverts to his former friendly and sociable manner, as if a weight has been lifted from his shoulders. 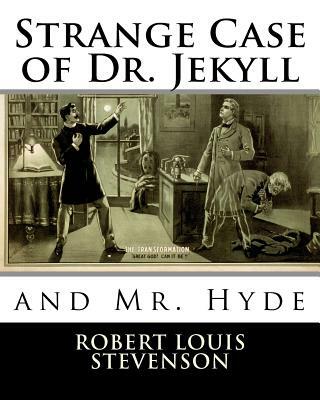 Later, Jekyll suddenly begins to refuse visitors, and Dr. Hastie Lanyon, a mutual acquaintance of Jekyll and Utterson, dies suddenly of shock after receiving information relating to Jekyll. Before his death, Lanyon gives Utterson a letter, with instructions that he not open it until after Jekyll's death or disappearance. Utterson goes out walking with Enfield, and they see Jekyll at a window of his laboratory; the three men begin to converse, but a look of horror comes over Jekyll's face, and he slams the window and disappears. Soon afterward, Jekyll's butler, Mr Poole, visits Utterson in a state of desperation and explains that Jekyll has secluded himself in his laboratory for several weeks, and that now the voice that comes from the room sounds nothing like the doctor's. Utterson and Poole travel to Jekyll's house through empty, windswept, sinister streets; once there, they find the servants huddled together in fear. After arguing for a time, the two of them resolve to break into Jekyll's laboratory.